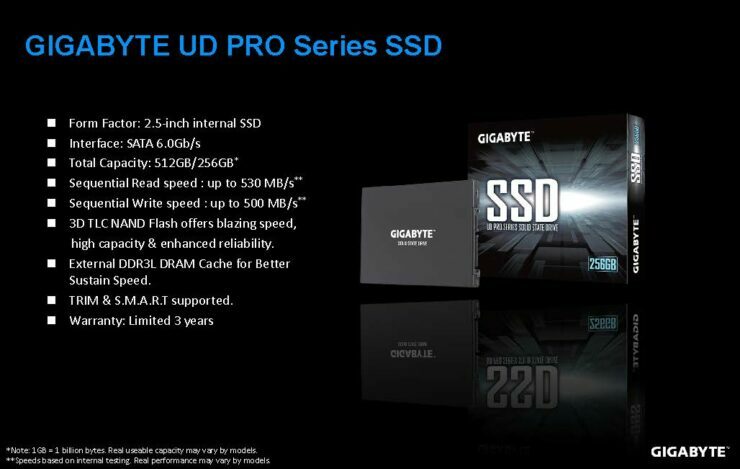 Gigabyte is proud to introduce the new Gigabyte UD PRO series SSDs in both 512GB and 256GB options. These new drives feature a clean look and sleek design featuring a grayish black exterior with the Gigabyte name engraved in white. 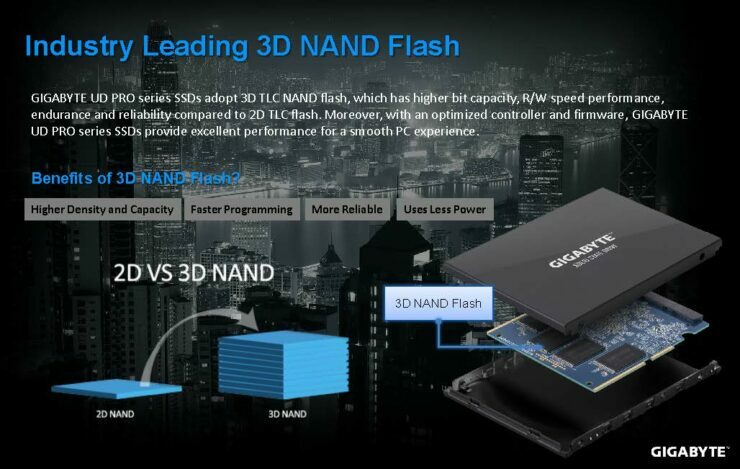 Using undisclosed 3D NAND Flash memory they also come with a high-speed DDR3L buffer cache to accelerate the read/write speeds of the SSD, fulfilling the Gigabyte standard for high quality products. As for the controller Gigabyte remained hush. 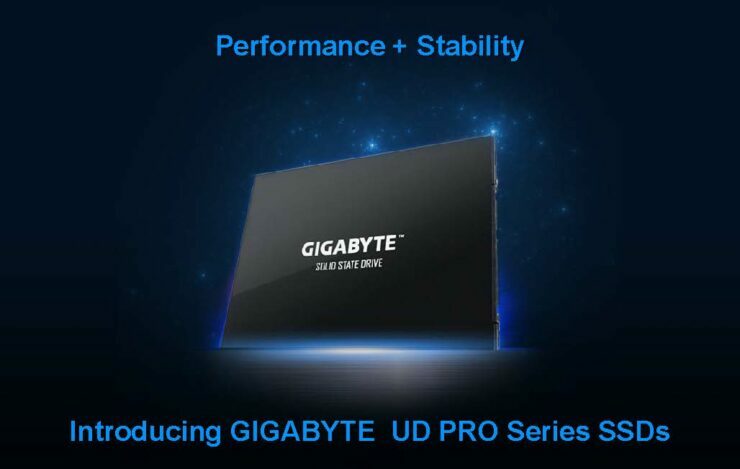 In comparison to standard SSDs without built-in buffer cache, the Gigabyte UD PRO series SSDs are twice as effective even when its flash memory is at full capacity. 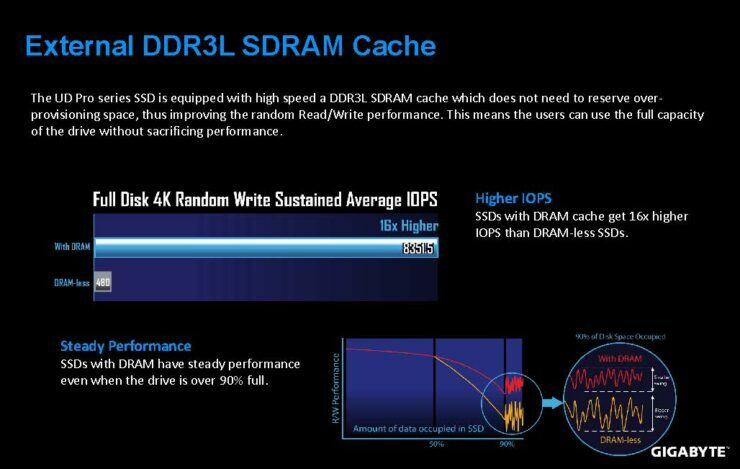 At the same time, the random write (IOPS) is up to 16 times faster than non buffer cache versions. This integrated DDR3L RAM allows users to make use of the entire flash memory capacity without sacrificing perfomance, quality or storage capacity. It’s important to note that Gigabyte has thoroughly tested the UD PRO series SSDs by implementing them on a full range of motherboards with their respective chipsets to evaluate both the functionality as well as durability of the SSDs. Through stress tests under high temperatures and other extreme conditions, the UD PRO series SSDs not only passed the tests but performed flawlessly. Jackson Hsu, Deputy Director of the GIGABYTE Channel Solutions Product Development Division. 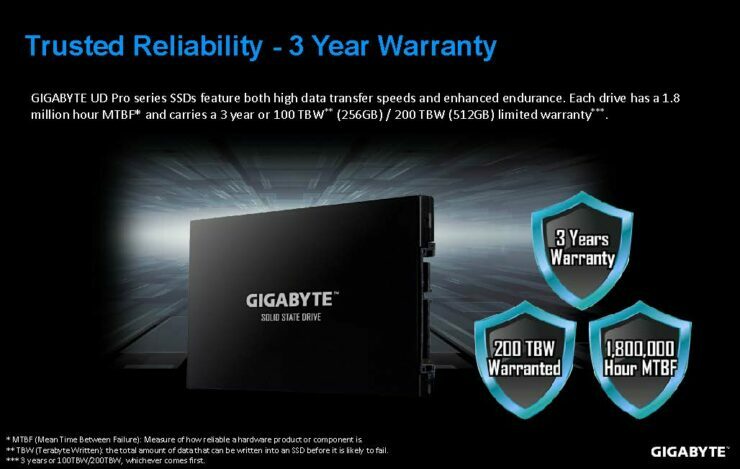 The Gigabyte UD Pro Series SSDs come with a 3 year or 200TB written warranty and Gigabyte has told us they expect it to hit store shelves next week. The 512GB drive is expected to be priced at $119.99 and the 256GB drive is expected to hit $68.99 right along the price of the Mushkin Source and other similar drives from Crucial. 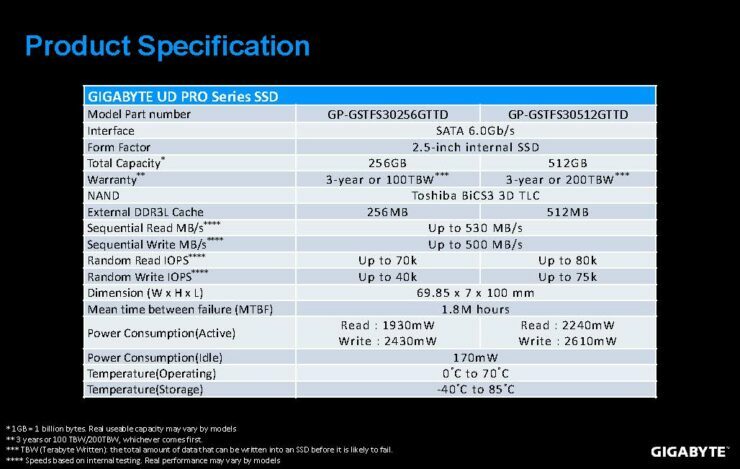 EDIT: Gigabyte has replied to our email inquiry and revealed the NAND is Toshiba BiCS3 and it uses a Phison controller.